Courtesy Noble County Sheriff's Department: A Ligonier man and two daughters died this morning when a car crashed into the Elkhart River near Ligonier. A Ligonier man and two daughters died this morning when a car crashed into the Elkhart River near Ligonier, the Noble County sheriff's department said. JJ Reyes, 50, of Ligonier, and his daughters Zulia, 15, a sophomore at West Noble High School, and Valeria, 13, an eighth-grader at West Noble Middle School, died at the scene of the crash, the sheriff's department said in a statement. The crash occurred just before 10 a.m. near County Road 700 West and Ball Road, the statement said. It said emergency responders located a white Toyota upside down and submerged in the river. Reyes was driving south on the county road, the statement said. It said he entered the curve at Ball Road and lost control on the snow-covered road. 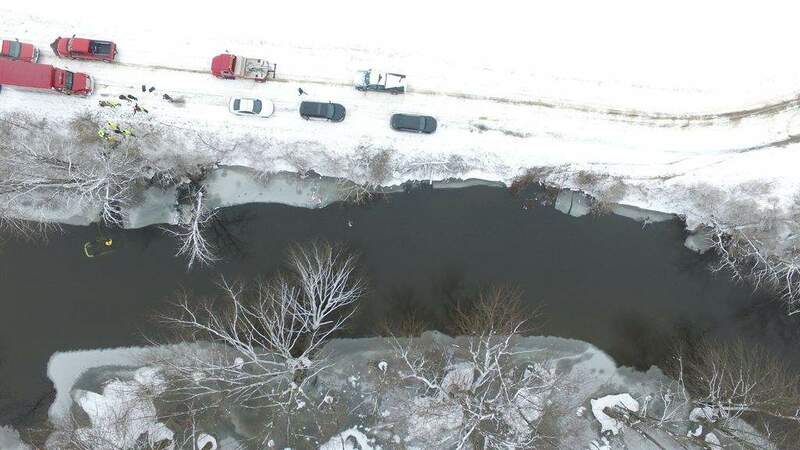 The car slid off the south side of the road, into a ditch and then into the river, the statement said. It said the car was carried about 180 feet downstream before flipping over and submerging. Ligonier Fire Department responders attached a tow cable to the car and pulled it from the river. They discovered the victims inside the car. "It appears the driver's speed was (too) fast for conditions," the sheriff's department said. The crash remains under investigation by the sheriff's department and Indiana conservation officers. Ligonier police, Parkview Noble EMS, the county coroner's office and Leatherman's Towing assisted at the scene.